Despite what the members would have you believe, Public Service Broadcasting is far from your average band. Helmed by J. Willgoose Esq. and driven by the percussional talents of trusty drummer Wrigglesworth, this pseudonymous British two-piece is unlike most. The band’s sound comprises of samples unearthed from dusty public information archives intertwined with an exhaustive array of stringed and electronic instruments–making for an unlikely but intensely emotive aural collage. It’s been a non-stop ride for Public Service Broadcasting since EP “The War Rooms” was so warmly received in 2012. A full-length album, “Inform – Educate – Entertain,” and a mammoth touring schedule followed, with a DVD released last fall to explore in depth the sources and inspiration behind the carefully researched clippings. PSB’s vocals draw from a diverse array of sources including, but by no means limited to, WW2 bulletins, a reading of W.H Auden’s poem “Night Mail,” an American advertisement warning against dangerous driving, and the 1953 film The Conquest of Everest. Live performances are even more mixed media, utilizing projectors and vintage television sets to broadcast (literally) the accompanying visuals. It’s an eclectic mix for sure, but the effect is far more rousing than a band which self-describes as “underwhelming” would admit. It’s clearly a time-consuming process, and Willgoose reacts indignantly to any suggestion that the two have been lying low since their last release. “We haven’t been hiding! Unfortunately, I could have done with a bit of hiding away. January we even managed to spend writing new material for the next release, whenever that might see the light of day,” he said. “I think what we’re trying to do is sufficiently tongue-in-cheek, not to be too highbrow or arch or pretentious, hopefully,” he elaborated. “Entertaining is the main thing that we’re about. If people take other bits and bobs away, then that’s good too, but we want to entertain people. One of the best things anybody has ever said about our gigs recently said he was looking round the crowd at our London Forum show, which was a massive deal for us, and everybody just had big smiles on their faces. 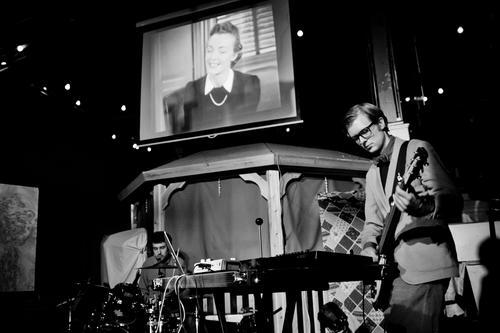 Public Service Broadcasting plays tonight at Privatclub in Berlin. The show begins at 20.00. This entry was posted in Interview and tagged British, Feature, Interview, Public Service Broadcasting. Bookmark the permalink.